Since the cells cannot store sufficient levels of oxygen for more than a few minutes at a time, the body needs a steady supply of oxygen from the environment. Several natural methods of increasing oxygen levels in the blood help you avoid the effects of low oxygen levels and improve your health. Oxygen levels increase during exercise due to a physiological response controlled by the brain. The medulla controls respiration rate during many activities, including sleeping, exercise and eating. During exercise, the cells burn oxygen more quickly than they do while at rest. As carbon dioxide levels increase, the brain increases the respiration rate of the body to supply more oxygen to the cells. Eating antioxidants allows the body to use oxygen more efficiently so that it enters the bloodstream in the proper amounts. Antioxidants include vitamin A, vitamin C, vitamin E and coenzyme Q10. 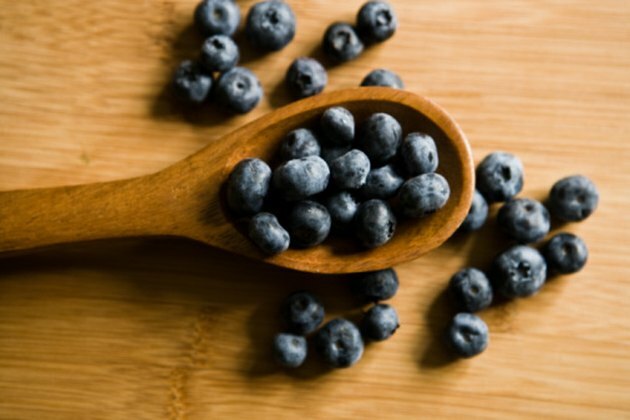 Examples of antioxidant-rich foods include blueberries, cranberries, red kidney beans, artichoke hearts, strawberries, plums and blackberries, according to Dr. Ben Kim, a chiropractor in Ontario, Canada. Carbon monoxide and fluoride interfere with the amount of oxygen the body takes in and sends to the bloodstream. Get fresh air whenever possible, especially in areas free of gas fumes, vehicle emissions and other chemicals. Essential fatty acids like vitamin F increase the amount of oxygen the hemoglobin in the bloodstream can carry. The body cannot produce the essential fatty acids linoleic acid and alpha-linolenic acid, so you need to eat foods that contain these substances. The George Mateljan Foundation reports that sunflower oil, canola oil, sunflower oil and safflower oil contain linoleic acid. Good sources of alpha-linoleic acid include soybeans, walnuts and flaxseeds. The University of Missouri-Kansas City reports that improper breathing may reduce blood oxygen levels by 20 percent. Shallow breathing also reduces the amount of oxygen carried in the bloodstream. Improve your blood oxygen levels by performing deep-breathing exercises. These exercises increase energy, cleanse the lungs and increase the amount of oxygen in the blood. Alcohol and drugs impact the oxygen level in the blood due to the oxidative process used to metabolize and remove these substances from the body. Avoid drinking alcohol or using drugs to avoid harmful effects on your tissues and organs. Dr. Ben Kim: Which Foods Contain the Most Antioxidants? How Do I Clean Lungs After Quitting Smoking? What Happens When You Burn More Calories Than You Eat?